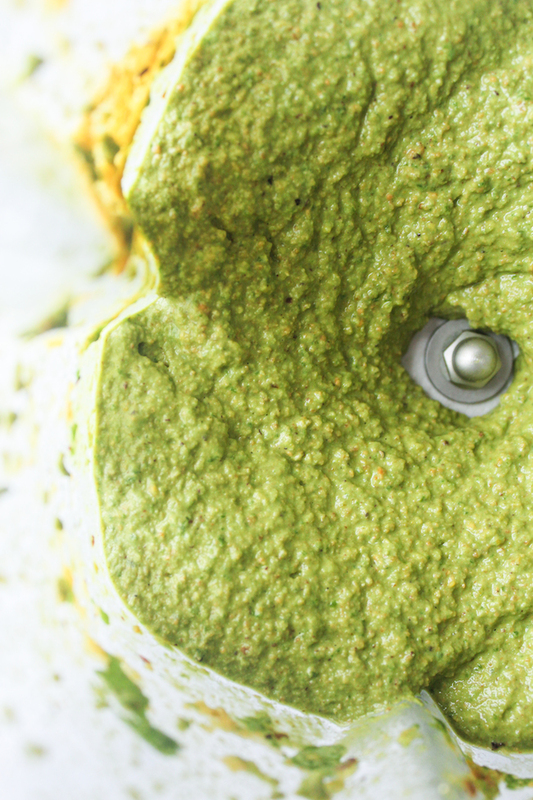 This pesto is so good, it's the whole reason I started a blog. I traveled to Turkey this summer with my sister and brother in law and the most memorable meal of our trip was this amazing zucchini noodle with pesto dish at a tiny vegan restaurant in Istanbul. The zucchini was the perfect al dente, the pesto was refreshing and creamy, and it was finished with a delicious almond cheese crumble on top. All three of us loved it so much, we went back to the restaurant a second time. When I got home, I tried recreating it but with my own twist. 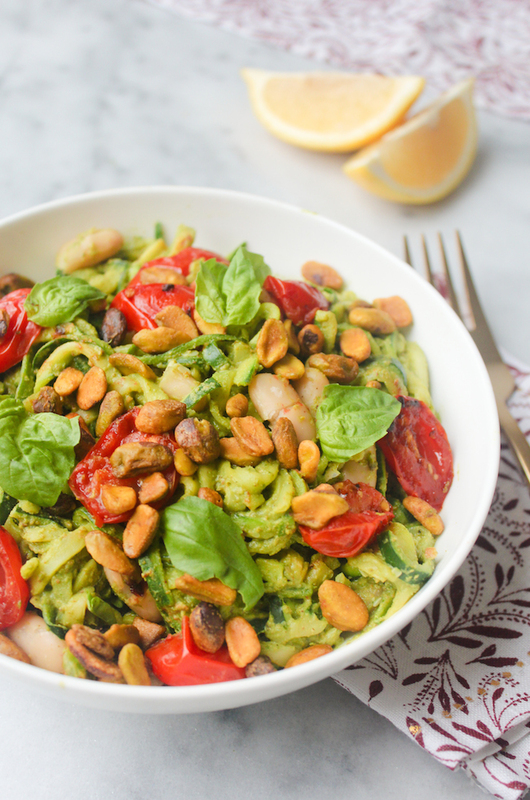 Instead of a traditional pesto with pine nuts, I used roasted and salted pistachios. I also used vegetable broth in place of olive oil and mixed in white beans and sautéed cherry tomatoes. 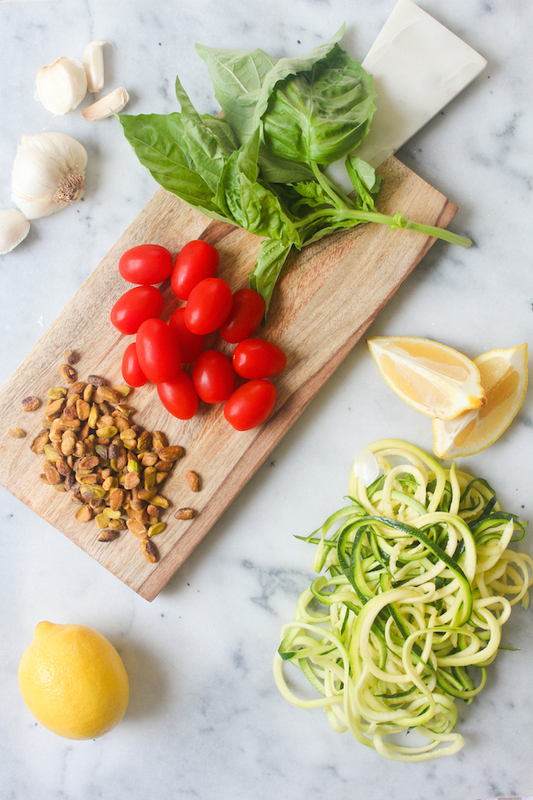 At first, I was a little intimidated by how to find a good spiralizer to make the zucchini noodles. I ended up buying a great, compact one at Bed Bath & Beyond for about $15 and know they can also be found on Amazon. If you don't have a spiralizer, it's a really great tool to add to your kitchen. I love this dish because it's light and centered around vegetables but still super filling. If you follow a plant-based diet, you're probably all too aware that restaurants often rely on carb heavy entrées for their vegetarian options, pasta in particular. When you're first cutting back or eliminating meat, dairy, and eggs and not sure what to cook, it's easy to fall into this trap of eating mostly carbs for every meal, which can make you feel tired and weighed down. That's why it's important to eat a mix of veggies, fruit, protein, and carbs. This dish is a great place to start if you've been feeling out of balance because its full of delicious veggie goodness. 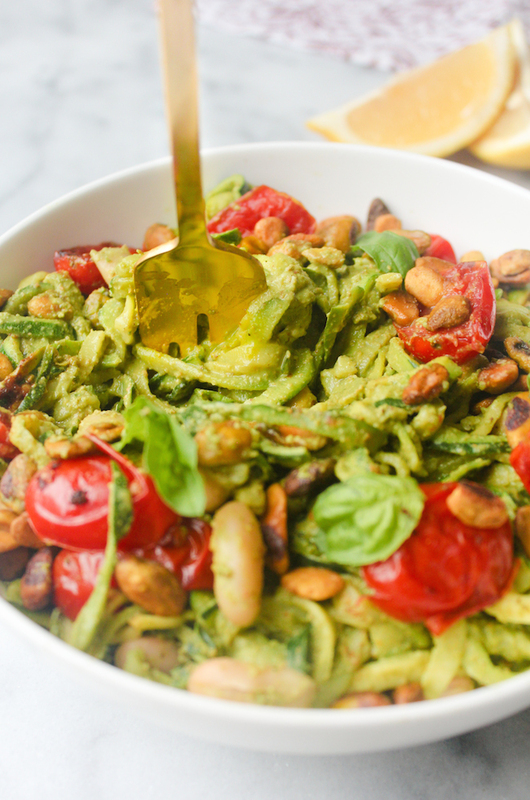 The pesto is really what makes this dish special. It's so flavorful and versatile, its become a staple that I make weekly and will add to just about anything I'm having. I love mixing it with more vegetable broth and using it as a dressing for salad or putting a big dollop of it in the middle of roasted veggies and quinoa that I'll bring with me to work for lunch. 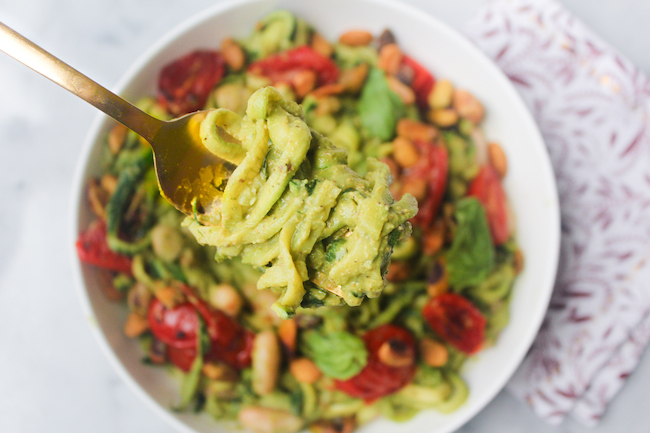 I'd been thinking about starting a blog for a while, but when I created this pesto, shared it with friends, and received such positive feedback, I finally decided to go for it so I would have an outlet to share recipes like this one. I hope you give this dish a try and love it as much as I do. 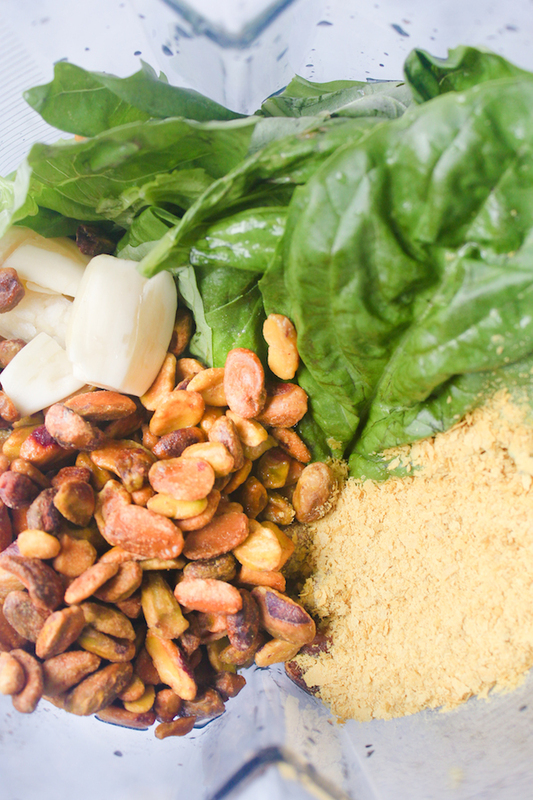 - To make the pesto, place all ingredients plus salt and pepper to taste in a blender or food processor and blend for a couple minutes until smooth. Set aside. - In a nonstick pan, sauté the cherry tomatoes with salt and pepper to taste for about 5 minutes. Remove from pan and set aside. 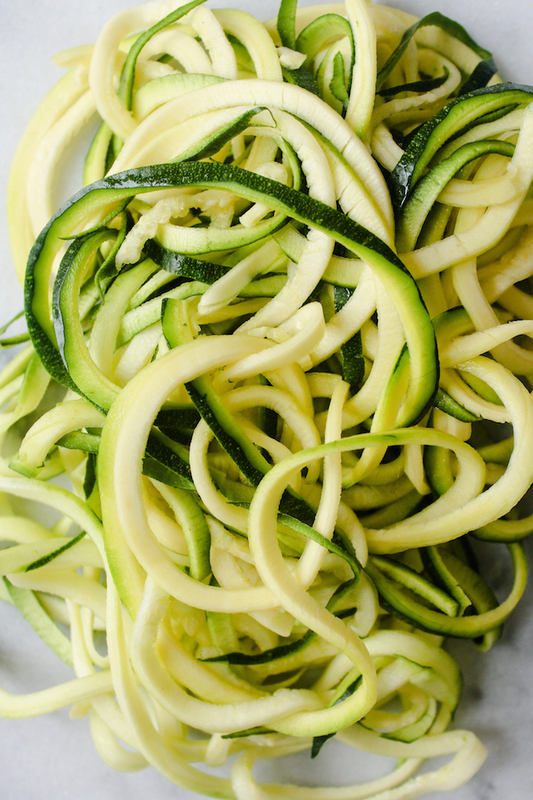 - Add spiralized zucchini to the nonstick pan with salt and pepper to taste and gently heat for a few minutes. Add pistachio pesto (you will likely not use all of it) to the pan and stir to coat noodles, adding more vegetable broth if needed. Cook for an additional minute or so until al dente. Remove from heat and toss in the sautéed cherry tomatoes and white beans. 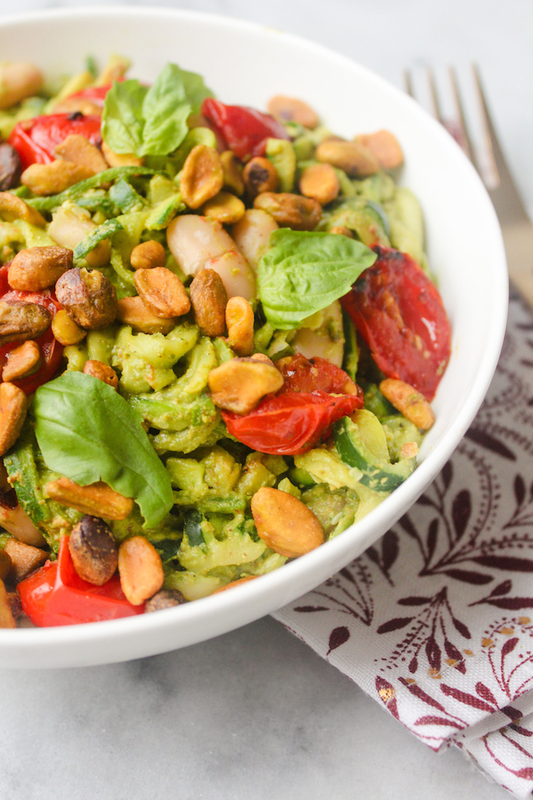 Place in bowls and top with leftover pistachios. Enjoy! 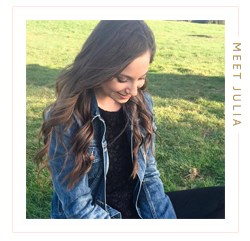 Just came across your blog - beautiful photography and recipes look fab. I just started a food blog as well and currently travelling in India. Thanks so much! I checked out your blog - your photography looks beautiful as well and love your post on meditation. I've been experimenting with short meditations each day for the last year or so, it makes such a positive difference. Enjoy your time in India!